Mother of the Bride, are your daughter and her beloved planning a beach-locale honeymoon? If so, here is the perfect photo idea—and oh so simple to do! 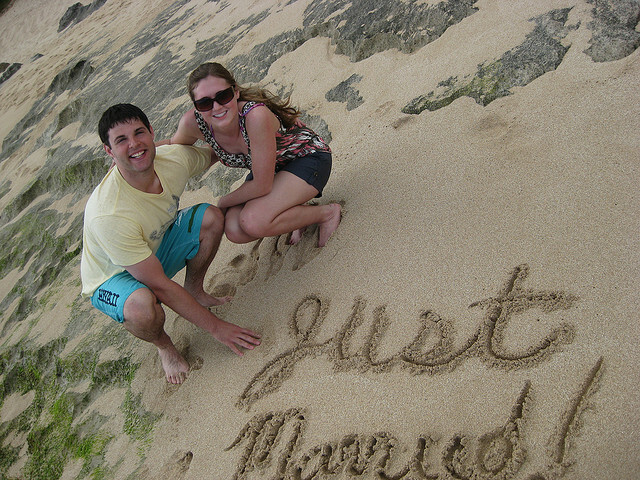 Tell your sweet couple to take time to write “Just Married” in the sand and then ask another beach-goer to take their photo posing by it. (Who wouldn’t want to help newlyweds create a memory?!) They can make their written proclamation as simple as or as elaborate as they choose. The only rule is to have fun doing it! The photo may not be professional quality like their engagement and wedding photos, but the memory of their honeymoon days will make this shot especially precious to them. They will always remember exactly where they were and how long they’d been married when this photo is taken. They may even want to take a series of shots. If so, tell them to be sure to include one with a kiss. Might as well make it as fun as possible, right? And MOB, if your newlywed couple is not going to a beach locale, what creative ideas could you suggest for a honeymoon “Just Married” photo for them? They will be more than happy to hear your ideas so suggest away! *You might also like to read about another great beach shot: Bridesmaids Hold the Groom!